Over the holiday season I am always more inspired to cook. I love to cook, and I love to share what I make. So when a friend gifted me granola for the holidays, I was delighted....and then inspired! I am a big fan of granola, I usually eat it half and half with a plain flake cereal so it isn't as intense, or with yogurt. That's me always standing in the cereal isle for a good 15 minutes contemplating which granola I will get, which of them is going to be "more amazing" than the last! Of course, they are all good but, there is always an element not quite right. Cue, the remedy: home made granola! I researched a few different recipes online and then tweaked them depending on ingredients that I like/didn't like/wanted included. I encourage you to have fun with it, it's not like baking where you can mess up the cake by adding something wrong or leaving a key ingredient out, it will still be delicious in the end! I love raspberries, and I love dried fruit in my granola, so I decided to be ambitious and buy fresh raspberries and dry them in my food dehydrator. If you don't have one, you can dry them in the oven, or you can just buy dried fruit to use in your granola. If you do dehydrate your fruit yourself, remember to start early, that process takes about 8 hours in the machine. Another element I decided I wanted to incorporate was making my walnuts "candied". Whenever I buy granola, I love those little sweet nut nuggets! Preheat the oven to 425º F for this part of the process, do them first so they have time to cool. I broke up the nuts by hand in to smaller pieces and then buttered a smaller cookie sheet and spread them out. Drizzle the agave over them and then about 1/4 of the brown sugar. Place in oven. Monitor them so they don't burn. About 10-12 minutes. They should be golden and the sugar should be completely melted, let them cool. Turn the oven down to 325º F to cook the granola. And... grab a glass of wine! Enjoy your afternoon of baking. I chose a local organic wine from NY: Shinn Estate. 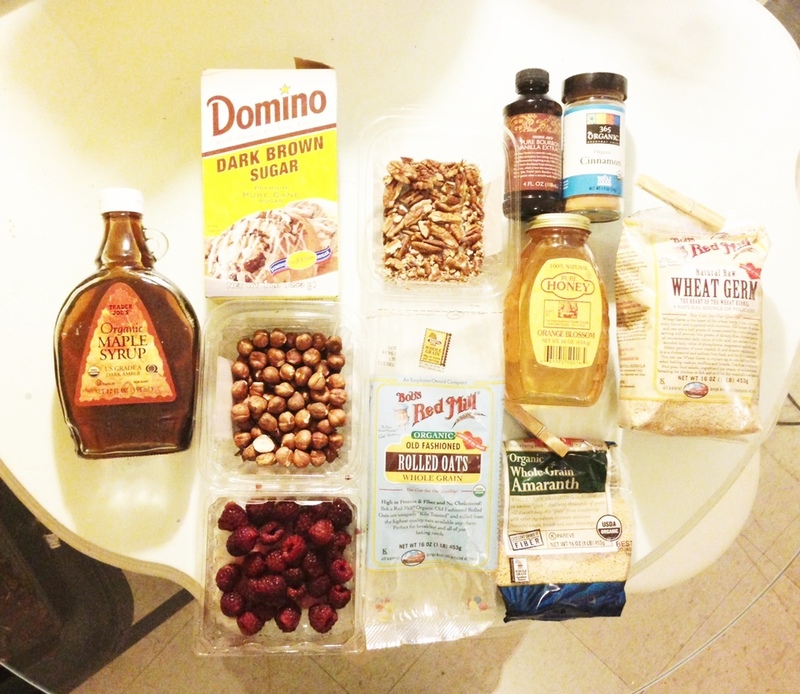 Combine the oats, wheat germ, hazelnuts (broken up into smaller pieces), and amaranth in a bowl. In a separate bowl combine the salt, brown sugar, maple syrup, remaining brown sugar, remaining honey, olive oil, cinnamon and vanilla extract. 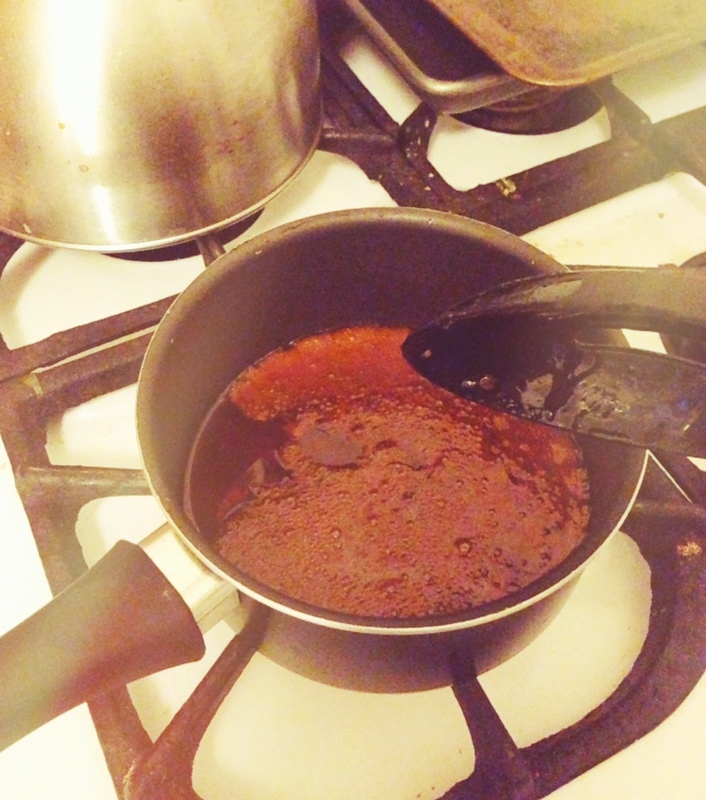 in a small sauce pan, bring the brown sugar mixture to boil, stirring constantly. Transfer the mixture into the oat mixture and stir to disperse evenly. Spread the mixture into two baking pans, place evenly. Cook in oven approximately 20 minutes until lightly toasted. While the granola is cooking, the walnuts should have cooled down, scrape them off the pan and place in bowl to mix into granola later. 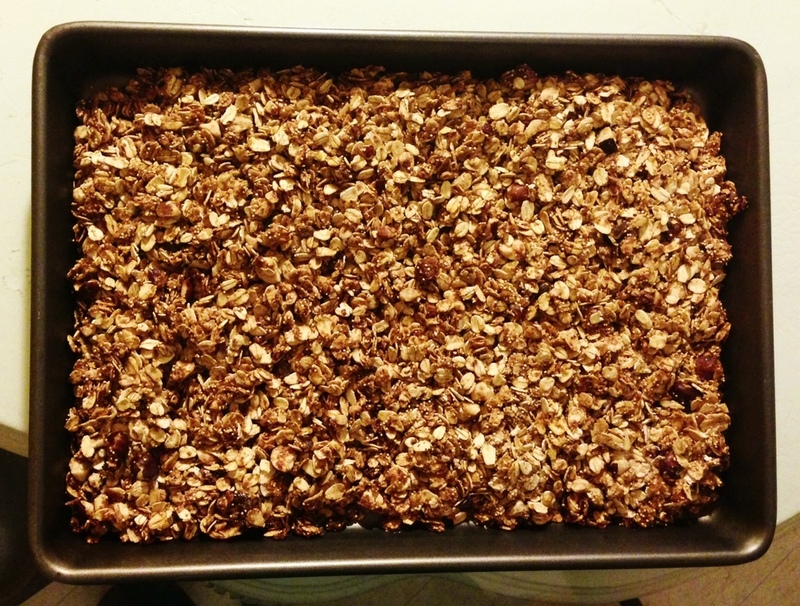 Remove granola from oven and let cool for about 15 minutes, should be dry and crunchy. Transfer to large bowl, mix in walnuts and the dried raspberries (or fruit of your choice).